Search for cheap hotels in Famagusta, North Cyprus from budget to luxury. Use our booking tool to compare and book Famagusta hotels from the best hotel deals. 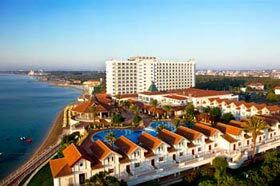 A 5 star hotel set on its own private golden beach in Famagusta, North Cyprus. It offers luxury accommodation in a fabulous position overlooking the blue waters of the Mediterranean Sea. It is located 3km from the centre of Famagusta City Walls, a 40 minute drive from Ercan Airport and 60 minute drive from Larnaca Airport. 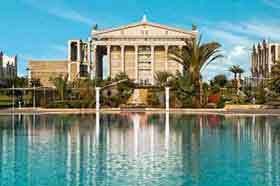 An extraordinary hotel with an exceptional architectural style featuring the ancient Temple of Artemis situated on one of the most beautiful beaches of Cyprus in Bafra, near Famagusta, Northern Cyprus. It offers elegance in stunning surroundings and an extensive array of luxury facilities for everyone. It lies about 40 minutes' drive from the centre of Famagusta. This is one of the all-inclusive hotels in Famagusta situated on the coast of the Salamis Beach, famous for its golden sands and blue waters. Most rooms overlook across one of the Mediterranean's most famous seafronts. It offers modern comforts, stunning lagoon style swimming pool and excellent facilities. The city centre of Famagusta is 10km away. Situated on one of the most beautiful beaches of Cyprus Island, Noah's Ark Deluxe Hotel & Spa in Bafra, near Famagusta, North Cyprus is large holiday complex offering tranquillity and relaxation under the Mediterranean sun. The hotel offers unlimited entertainment, activities and facilities for everyone. Perfect for those looking for luxury beach holiday. 40 km from the Famagusta city centre, situated on the beachfront with private sandy beach, Limak Cyprus Deluxe Hotel in Famagusta, North Cyprus is a luxury hotel in a peaceful location, offering a luxury holiday of four season in the Mediterranean. It offers first class luxury with distinguished service and excellent kids facilities. Built on its own beach, Ultra All Inclusive Concorde Resort Hotel & Casino in Famagusta, North Cyprus offers contemporary style, luxury guest rooms and a wide range of facilities for a comfortable and enjoyable holiday in Northern Cyprus. Some facilities include a magnificent private sandy beach, SPA & ​​wellness, children's aquapark, casino and more to add. Located in garden of Salamis, Oscar Park Hotel is a chic welcoming boutique-style hotel in Famagusta, a great choice for a cheap hotel near Famagusta centre. Evolve Park is a budget hotel located on one of the busiest street in the hearth of Famagusta city centre, perfect to explore historical sights and business, pleasure or a city break. There is an indoor swimming pool available for the swimmers during winter season. An all-inclusive Famagusta hotel offering 1.5km of sandy beach with golden sands, tranquil surroundings with the finest culinary experiences, facilities and activities to suit all ages and quality accommodation surrounded with beautiful botanical garden with around 300 plant species. It is 40 minutes' drive from Ercan Airport. Located in the village of Iskele, near Famagusta, Sea Life Hotel is perfect for a peaceful holiday in Northern Cyprus. A great base for seminars, yoga tours, conferences, as well as sightseeing tours. It also features a health and beauty Centre. Located in the hearth of Famagusta city centre, Port View is a great base to explore the area. Historical attractions, local amenities, restaurants and shops are within walking distance from the hotel. Situated on the bay of Famagusta, North Cyprus, Long Beach is a small resort of semi-detached bungalows and villas positioned directly on a spectacular beach, generally regarded as one of the safest on the island. Many of the rooms here sit right on the beachfront and enjoy a spectacular, panoramic view of the Salamis bay. Located in the village of Dipkarpaz, the Karpaz Arch Houses is a guesthouse consisting of delightfully restored, traditional village houses and buildings. The guesthouse is ideally located to explore the traditional culture and stunning natural beauty of the Karpaz area, famed for its wildlife and long deserted Golden Sands beach. This is a small basic hotel in the Karpaz area offering rooms with air-conditioning and shower, as well as a restaurant serving tasteful dishes of Turkish Cypriots. If you would like to explore the Karpas National Park regarded as the nature reserve of Cyprus because it is undeveloped and rich in wildlife, this hotel is ideally located.